This trip was different. We had already enjoyed a mix of new and old haunts with a mix of sight-seeing, Odo-spotting and socialising (meeting friends Mike and Linda Eaton) at Montagnac for a week. We’d already enjoyed four weeks of almost unbroken sunshine. Technically, Luc and Nadine close their campsite at the end of September though they are normally helpful enough to let us stay on a few extra days if we want. Our friends were all leaving, though; we were in danger of feeling like Billy No-mates, which did not appeal. Nor were there any dragonflies of any note with which to amuse ourselves. Furthermore, the weather forecast was excellent for the coming five days and we were looking longingly at clear blue skies over the Pyrenees. We love mountains – you can keep your beaches – but, all too often their weather is unsettled. 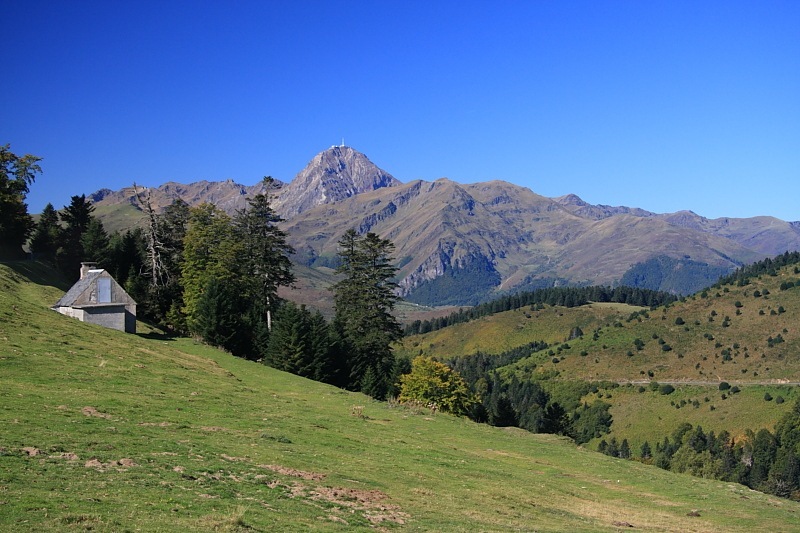 Not wishing to miss a rare clear spell on the French side of the majestic Pyrenees, we happily packed up and headed for Bagnères-de-Bigorre. When we come to the end of a spring trip to France, Channel 4’s excellent TV coverage of Le Tour de France softens the blow of being at home again – it lets us down gently. Helicopters fly TV cameras around some of the more intriguing sights in the countryside surrounding the stages and we can enjoy the feel of France again vicariously. 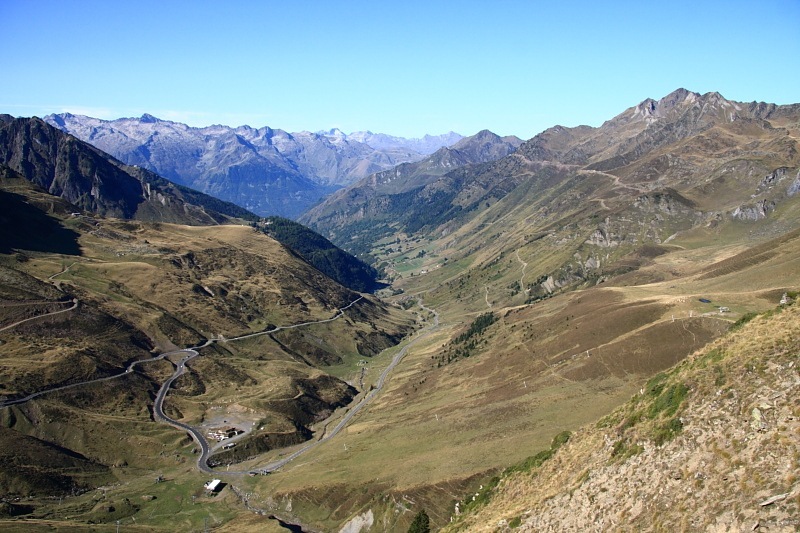 Le Tour always, but always, visits both the Alps and the Pyrenees. Let’s face it, the French don’t think they are truly cycling unless they are pedalling up a painfully steep and seemingly never ending hill. At Bagnères-de-Bigorre we were within striking distance, in a car you understand, of three notable Tour de France cols. With this weather and this scenery, we had no trouble amusing ourselves. On our way down from the col d’Aspin we happened across a very picturesque leisure area around the Lac de Payolle. That is, it would normally have been picturesque but this was a Sunday and the place was buried under dozens of camper vans. Furthermore, this Sunday was the French fêtes des grands-pères [grandfathers’ day] and the dozens of camper vans had been joined by dozens of picnicking families with grand-père in tow. Nonetheless, it was a large area and very agreeable. Being the Lac de Payolle. in the large area was a decent sized lake – dammed, of course, as are most French lakes – clearly designed for leisure pursuits. However, at its top end the lake was fed by something resembling a flush. What Odo-nutter could resist a flush when the season was not quite over? Certainly not I. ‘T was a good job, too. Several hawkers were buzzing around including Southern Hawkers. However, there were others that I didn’t immediately recognize. After much stressful snapping, mostly on manual focus, I eventually snagged a shot of a male in flight. 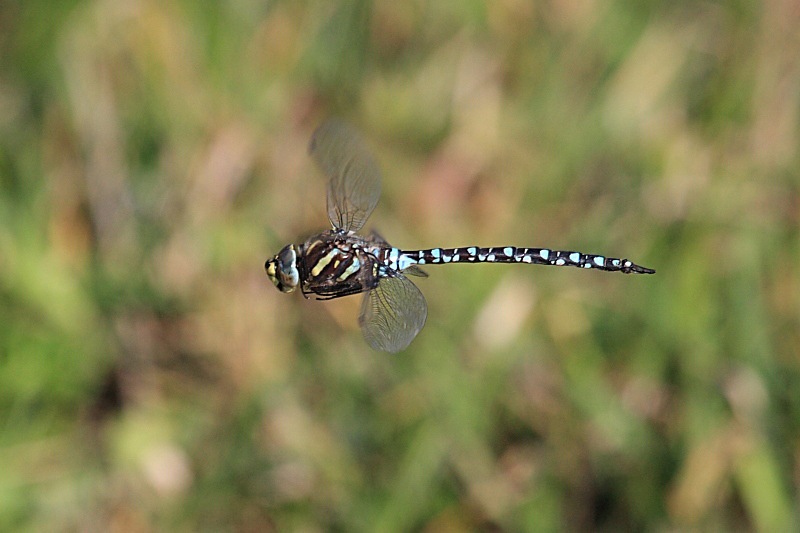 New species #8: a Common Hawker (Aeshna juncea). This may be a so-called Common Hawker but I’d never seen one before. I did snag a female ovipositing, too, but the flight shot is the only shot I got of the male, the darn things just would not settle. it comes to something when a shot in flight is “easier” than a stationary shot! IMHO this was a classic trip, the weather was great, our stops worked out well, we enjoyed some good times in the company of friends and we got to see new dragonflies to add to our growing catalogue. 30 confirmed species overall, including eight new ones, I regard as a decent tally. I don’t want to see them all in one year – what would I do to amuse myself next year?